When flooding hit Alabama, the sewer system couldn’t handle the water. As a result, sewage started overflowing in the streets. State health officials were forced to issue a warning advising residents to take care and wash their hands. This isn’t a lone incident. In the aftermath of virtually every natural disaster, we see a huge hygiene crisis unfold. 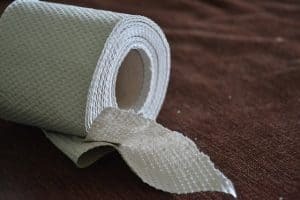 In addition to sewage overflowing, there are issues like: human waste because toilets aren’t working, rotting garbage, infectious diseases, and pollutants. With disgusting waste running through the streets, it goes without saying that hand washing is even more important during disasters! According to DEB, the average person uses approximately 0.39 to 0.46 gallons of water each time they wash their hands. Consider that you’ll need to wash your hands approximately 4-8 times per day (before meals, after going to the bathroom, when emptying your emergency toilet…). That adds up to a lot of water! Don’t forget that you also need water for drinking, cooking, and other hygiene uses. That could quickly add up to over 5 gallons of water per day. I shouldn’t have to tell you that storing this amount of water can be problematic (read: How much water to stockpile for emergencies). The solution? To wash your hands using less water. There are several methods you can use to reduce water use when washing hands. Here’s an overview of them, including instructions for making emergency sinks which use less water. When you have no running water, hand sanitizer is a good solution for cleaning your hands. The CDC cites research that shows hand sanitizer can kill bacteria, viruses, and other germs on your hands effectively. However, it is important that you choose an alcohol-based hand sanitizer with at least a 60% concentration of alcohol. Hand sanitizer without alcohol or with lower amounts of alcohol will not effectively kill germs. Washing your hands with soap and water is still the better than hand sanitizer. Why? Hand sanitizer won’t kill all types of germs, including some parasites like Giardia. It doesn’t work well when your hands are visibly dirty. Many people don’t apply enough hand sanitizer for it to be effective, or they apply it incorrectly. The sanitizer is only effective against germs. It won’t remove chemicals, heavy metals, or other dangerous substances which may get on your hands. To use hand sanitizer correctly, you need to put a fairly large amount of it on one palm. Then you rub the sanitizer over both hands, making sure to coat all areas such as in between your fingers. Keep rubbing until the hand sanitizer has dried. Which hand sanitizer is best? It really doesn’t matter which brand of hand sanitizer you get so long as it has at least 60% alcohol. You do not want to get any of those “natural” hand sanitizers which do not contain alcohol. The higher the alcohol content, the more effective it is. I wouldn’t recommend dousing your hands in pure alcohol though. This will dry out your hands which in turn could make them so chapped that they crack and bleed. If you have open wounds on your hands (no matter how small), there is a higher likelihood that pathogens could enter your body. So, stick to products which are in the 60-80% range of alcohol content – like this one on Amazon. I use this method for washing hands when I go camping: take a normal plastic water bottle. Slightly unscrew the cap so a small trickle of water comes out when you turn it over. Have one person hold the bottle while the other person washes her hands underneath. This method is also great for when you need to spill out small amounts of water, such as for getting your toothbrush wet before brushing your teeth. Alternatively, you can poke a small hole in the cap of the bottle to let the water trickle out. However, that method only works if you are staying in one spot for a while. Otherwise, water will spill out of the bottle while you hike. 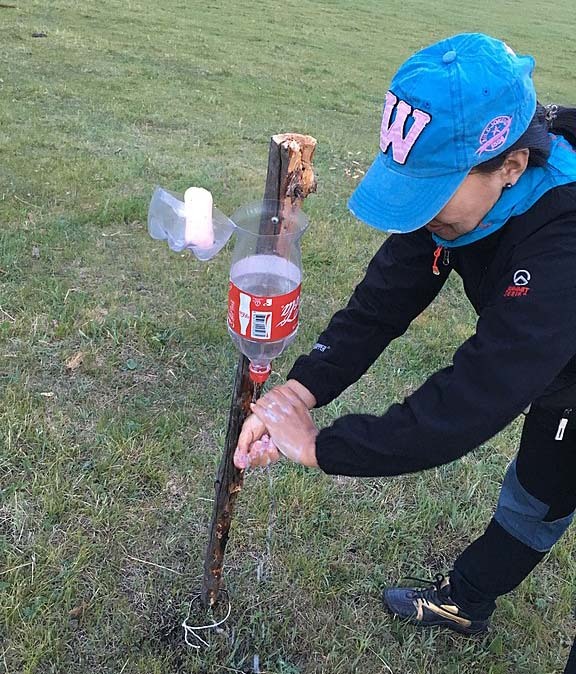 If you attach the bottle to a pole, you won’t need someone to hold it for you while you wash.
A tippy tap is similar to the method above, but is engineered so you can operate it by yourself and even (to some extent) control the water flow. You poke a hole in the cap of a plastic bottle. The bottle is hung over a horizontal pole or branch. When you want to wash your hands, you pull the bottle downwards so the water starts coming out. Some versions have foot pedals attached to the bottle which allow you to control water flow without touching the container. A bucket below the bottle catches the gray water. This prevents a puddle from forming and also allows you to reuse the gray water for things like flushing toilets. 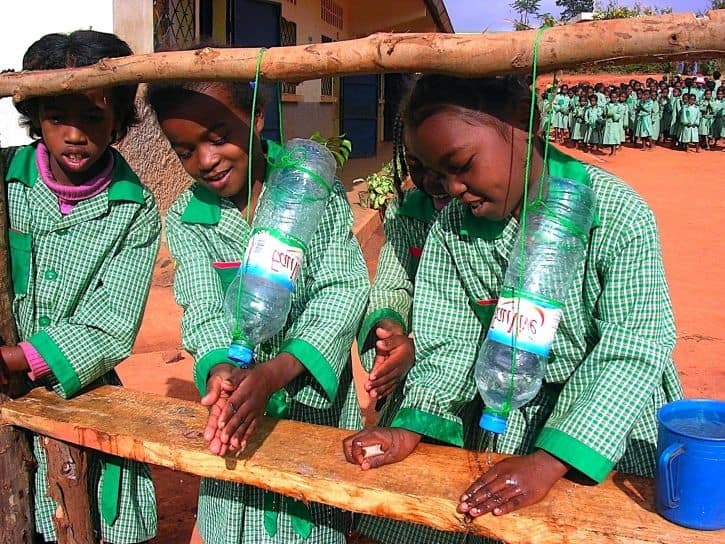 The tippy tap is very popular in undeveloped countries, such as shown in the image below of school girls in Madagascar. 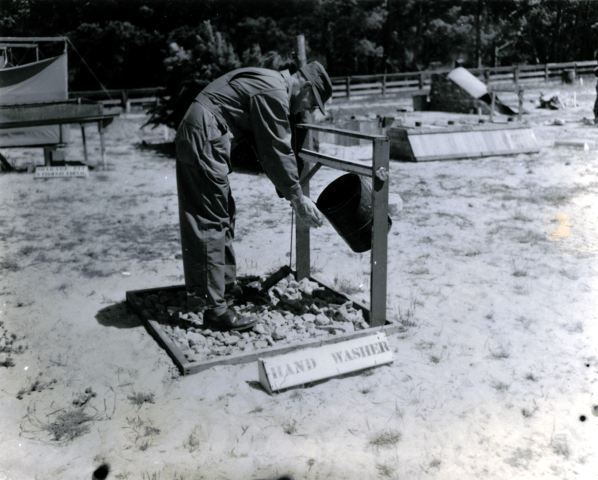 Tippy taps have apparently been around for a long time, as shown by this WWII soldier using one. If you have a lot of people staying in one location, then you’ll want to construct a larger hand-washing station like this one. It is made from two buckets and a valve which releases the water. The top bucket contains clean water for washing hands. The lower bucket collects the gray water so it can be reused for purposes like flushing toilets or watering crops. These instructions come from A Sewer Catastrophe Companion. You can see their detailed notes here. Drill a 1-inch hole in bottom center of one bucket. Go slowly so the bucket doesn’t crack. Carefully drill 8 small holes around the outer ring the PVC end cap using the 1/16” bit. Now drill a hole in the center of the PVC end cap using the ¼” bit. Drill a ¼” hole through the center of the bouncy ball. Screw the toilet float rod into the bouncy ball. Wrap Teflon tape around the 1” PVC adapter. Stick rubber gasket around the PVC threaded adapter. Screw the adapter through the hole in the bucket. Screw the end cap onto the part of the adapter coming out of the bucket. Make sure it is tight. Cut the finger off of a disposal glove. Put this part of the glove over the top of the PVC threaded adapter. Leave an opening around the rod. Put the bouncy ball with the float valve attached through the PVC threaded adapter. 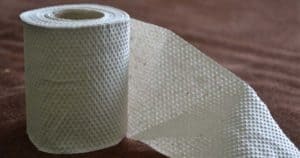 Attach the vinyl rod cap onto the end of the toilet float rod. When you push up on the float rod, it will cause the bouncy ball to lift off the hole so water comes through. You can now fill the bucket with clean water and hang it. A 5-gallon bucket will weigh about 45lbs when full, so make sure it is hung somewhere that can support its weight. The other bucket goes below it to catch the gray water. There are several models of portable camping sinks – like this one on Amazon – which could be used for emergency preparedness. A tank holds clean water. The tank is usually kept on the ground. You step on a pump to bring the clean water up to the faucet. Dirty water exits through a drain hose. 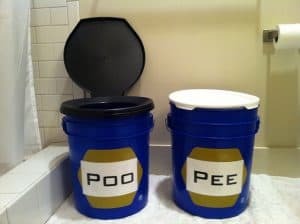 It can be collected in a separate container. The great thing about these sinks is that they are very easy to use. However, you are not able to control the water flow with them. 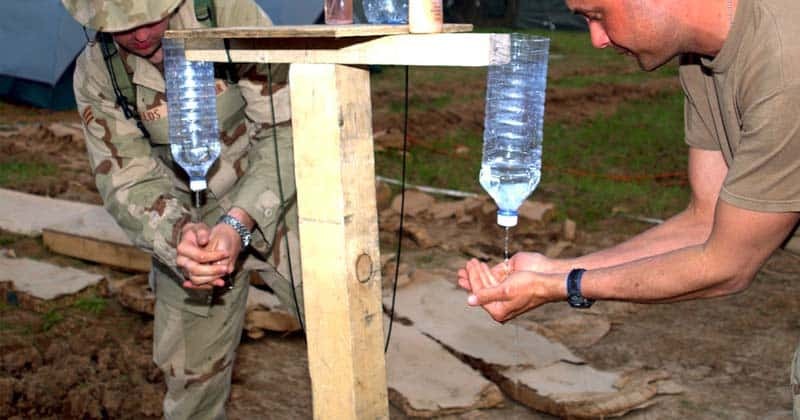 With most models, a single pump will bring about 0.5-1 cup of water. That’s a lot of water coming out at once! There are faucet handles on the sinks, but these only work if the sink is connected to a garden hose. 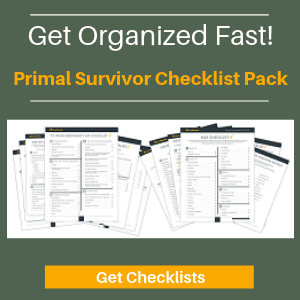 Because of how much water these use, I wouldn’t recommend them for disaster preparedness unless you have a large supply of clean water (such as from rainwater harvesting) and only need a way of utilizing the water easily. Wonderful article. Looked and couldn’t find how to subscribe to your site so hope this works. Hi Windy – you can sign up on the about us page (form at bottom of page) I have also gone ahead and added you manually. Hey TX – Like it, simple, effective and could be hacked together by most people in an emergency. Might be a little heavy on the water usage though. 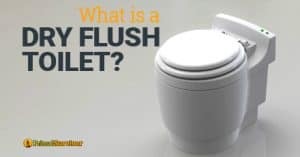 What Is a Dry Flush Toilet?